David West of the Indiana Pacers shoots against Chris Andersen of the Miami Heat during Game Three of the Eastern Conference Finals at Bankers Life Fieldhouse on May 26, 2013 in Indianapolis, Indiana. Miami Heat’s Lebron James scored 22, and Dwayne Wade put in 18 points as the victory put Miami Heat back on a 2-1 lead in the NBA Eastern Conference Finals. David West of the Indiana Pacers shoots against Chris Andersen of the Miami Heat during Game Three of the Eastern Conference Finals at Bankers Life Fieldhouse on May 26, 2013 in Indianapolis, Indiana. Miami Heat’s Lebron James scored 22, and Dwayne Wade put in 18 points as the victory put Miami Heat back on a 2-1 lead in the NBA Eastern Conference Finals. The Miami Heat rediscovered its offensive punch and beat the Indiana Pacers 114-96 on May 26 to take a 2-1 lead in the NBA Eastern Conference finals. LeBron James profited from a tactical switch, scored 22 points and got plenty of help as the Heat reclaimed the home-court advantage they lost two nights earlier. Dwyane Wade had 18 points, and Udonis Haslem added 17. “I made a conscious effort to get down in the post tonight, to put pressure on their defense,” James said. “The coaching staff wanted me to be down there tonight, and my teammates allowed me to do that.” It was a move reminiscent of when the Los Angeles Lakers played Magic Johnson in the post in place of the injured Kareem Abdul-Jabbar during the NBA Finals more than two decades ago. James rebounded from the two late turnovers that cost Miami in Game 2 by scoring 22 points, grabbing four rebounds and dishing out three assists. Hours after Dwyane Wade learned he would only be tagged with a flagrant foul from Game 2 and not a suspension, he finished with 18 points, eight assists and four rebounds. Chris Bosh added 15 points and three rebounds and all five Miami starters reached double figures. The Heat shot 54.5 percent against a team that finished the regular season with the NBA’s best defensive field goal percentage and also made 24 of 28 free throws. They matched the highest scoring output in a quarter during this season’s playoffs with 34, broke the franchise playoff record for points in a half (70) and fell one point short of tying the third-highest point total in a playoff game in franchise history. But the biggest difference between the first two games and Sunday’s comfortable win was what James’ work on the inside. 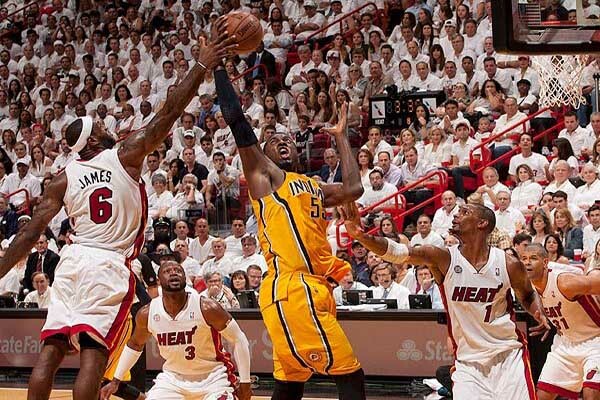 Now, with Game 4 scheduled for Tuesday, it’s the Pacers turn to adjust.